Now this is interesting, not necessarily because of what it is, but what this would mean if this kind of set-up was OK’d. Check out the video and read on for a run down of the machine. Also head to the Console Planet website for more info. Personally I don’t see the appeal of putting £1 in a machine to play a game I have at home. At least with real arcade games you are getting an experience you can’t get at home; proper lightguns, proper steering wheels, and motion bases for example. Also The Stinger Report has a big feature about the legality of this technology. “FragIsle has patents pending on several technologies around the arcade style of console gaming which drive additional revenue through the cashbox, and beyond. Where arcades have had dramatic pains associated with console or in home gaming devices, we have embraced them and developed entertainment specific to the genre and social demands of a console gamer. Featuring a high definition 42″ LCD screen in 16:9 aspect ratio is a requirement, and bundling with a premium sound system drives to the pulse of the console gamer. We also embrace their desired method of playing games with the standard game controllers. Sure, an arcade solution would seem to be better suited to joysticks, trackballs, and buttons. But one doesn’t need to look to far to see where this change had been attempted with limited success. Funny, I just came back from my local distributor and they said that a guy was at AMOA talking to them about something like this. In fact I wonder if it’s the same thing or not. I guess one advantage to it is it makes an OK rental experience – if they have a game stocked that you haven’t played yet, it may be a good way to try it out. Although I’m not saying that it should take priority over a real arcade title as it can’t even if it tries. This reminds me of those Dreamcast JAMMA boards you could buy that added a way to coin up specific DC games. I very briefly considered getting one for my arcade (since closed), but decided against it when I considered how many Dreamcasts I would burn out. Not to mention, it’s quite illegal. Same reason I never built a MAME machine and used it as an actual location piece. 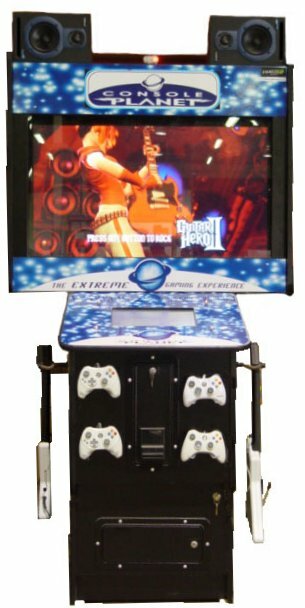 The feature we have on Console Planet reminds readers of the PlayChoice 10 systems, and also the whole legality issues. We were surprised by the naivety – and are worried by the can of worms that could be opened! Shaggy – yes that was the CP system at AMOA.